Fairy gardening is a very popular trend in the world of gardening. It is what I call “gardening with imagination.” Fairy gardening/miniature gardening is creating scenes and garden areas using small plants and accents. Your ideas and what you choose to create will make your garden truly a unique space. A fairy garden can be in a container or could be installed in your garden outdoors. The flexibility of what you can do will give all gardeners an opportunity to have a little extra fun in the garden or on the patio. Why call it fairy gardening? The legend is that fairies are not very good home builders. Everything they make seems to blow away in the wind or fall down under the snow in our climate. Therefore, fairies look for places to live in your gardens. If you make a little spot just for them, they will move right in. It is believed that wherever fairies stay they leave blessings. In your garden that could be more flowers, bigger vegetables, lusher lawns, and happier gardeners! At Pahls we have a new section in the market just for fairy gardens. It has been so much fun ordering in all kinds of fairy houses, accessories, accents, and everything else you will enjoy using for this creative hobby. We have beautiful fairies designed by Cicely Mary Barker that will bring your scene to life. We have our own program in place growing special new plants for your fairy gardens. We chose small interesting plants that will fit well in miniature scenes. Pahls also carries Alpine rock garden plants which are great for small areas and many are perennial in our zone 4 gardens. We hope you will come in and take a few moments to look at our planted displays. 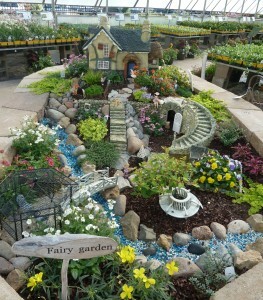 We have a large fairy garden in our first greenhouse and several examples of container gardens. The ideas are endless and your imagination will be your guide on this fabulous journey of fairy gardening. As you begin your adventure in fairy gardening, we can help you every step of the way. The principles of design are the same whether you are creating a container garden or a large in-ground installation. Click here to see our step-by-step process. With some basic advice, you will be on the road to creating your own whimsical, charming fairy garden. Click Here to view some customer Fairy Garden creations!